Chinatown Vegas you ask? Yes, Las Vegas has a Chinatown and it’s an amazing one in fact. And guess what? It isn’t in a casino! From nationally acclaimed food trucks to Michelin level dining, Chinatown Vegas has it all and is second to none. Dozens of Chinese restaurants that feature cuisine from all the regions of China, as well as various styles of Japanese, Korean, Vietnamese, Thai, Cambodian, Malaysian Filipino, and pan-Asian cuisines, are in abundance. Chinatown Vegas begins approximately one mile west of the Strip and continues on and around West Spring Mountain Rd (the West is usually dropped, known as Spring Mountain Rd) for approximately 3 miles. It begins around Spring Mountain and Procyon / Valley View and ends at Spring Mountain and Rainbow, at the Koreatown Mall. Our Chinatown has a short history, beginning in 1996 but while other Chinatowns around the USA shrink or disappear, Chinatown Vegas continues to grow, expand and improve. For first-time visitors, it can be a bit confusing to find since there is not yet a welcome to Chinatown sign or Dragon Gate as is common in other Chinatowns. Often the address to a restaurant is a strip mall location with more than a dozen other businesses. Sometimes it’s easier to park behind or on the second floor at one of the many Asian themed strip malls. But parking in Chinatown is horrendous. We recommend using Lyft. Usually, around $10 bucks will get you to a Chinatown restaurant from most places on the strip. Download Lyft. Use Lyft Promo Code “ChinatownVegas” to get free rides and credits! Our team of foodies and local experts have documented our Chinatown restaurants with great pride. In addition to sharing our own first-hand experiences, we include our tasting notes as well as quotes and reviews from Las Vegas’ top food critics and writers. We did this to help and encourage you to fall in love with Chinatown Vegas too. So let’s begin. A superb culinary Mecca awaits you. Spring Mountain Rd is the continuation of Sands Ave that splits between the Palazzo/Venetian and the Wynn /Encore Hotels and Casinos. Major intersections are Spring Mountain and Valley View, Spring Mountain and Wynn, Spring Mountain and Arville, Spring Mountain and Decatur and Spring Mountain and Jones. You will be heading west on your way to Chinatown. The first thing you will see is the Cultivate marijuana dispensary to your left and the Lotus Apartments on your right. At the intersection of Spring Mountain Rd / Valley View Blvd is Spring Mountain Square on the South-east corner. One of the anchors here is Subway. But you didn’t come to Chinatown for that, so you should skip it. Restaurants are in order from East to West (Coming from the Strip). Local Summerlin omakase restaurant set to open soon. Popular and homey Thai restaurant, open until the wee hours of the morning. Plenty of parking. Live music karaoke. Seafood lad na, duck curry, tom yum soup, tom ka soup, pad see yew are recommended. Full bar. Decent wine and beer selection. Live music and karaoke too. Open until 4 am. Started as a New York City hot dog cart and have become a world famous restaurant chain. Counter-service restaurant serving American Halal cuisine, gyros, falafel, and tasty middle eastern foods. While the name is cute, there is some good fresh fish and very affordable prices being served here. The owner was a former seafood distributor and still has great contacts with suppliers. Be sure to try the hot yuzu aioli and Spam Burrito! Delivery through Grub Hub and Door Dash. Open from 11 am to 10 pm 7 days a week. Las Vegas food critic Jim Bigley suggests ” Perusing chalkboard-touted daily special and uni shumai, octopus takoyaki and whatever you do, don’t miss the enoki butter, where thin mushrooms are delivered awash in butteriness with a swirl of pepper”. Full bar. Open from 5:00 pm – 2:00 am, 7 days a week. Unpretentious Vietnamese restaurant, open 24/7 serving noodles, rice, spring rolls, and other traditional Vietnamese dishes. Recommended dishes are Canh Chua ca (Vietnamese hot and sour soup, Banh Beo (Vietnamese pancake) Ca Kho to (caramel clay pot fish). Wine & Beer only. Family 0wned since 1973, Kung Fu Thai is the oldest Thai and Chinese restaurant in Las Vegas originally opened downtown. Extensive menu of Thai & Chinese dishes. Full bar. Wine, Asian beers. Open from 11 am to 10:30 pm 7 days a week. The next two restaurants are a little trickier to find. Two very short blocks south on the right side of Valley View Blvd., you will find the small alley-like Schiff Dr. Locally known as “behind Chinatown or “inside” Chinatown”, Schiff Dr. is home to the next two great restaurants as well as boxing great Floyd Mayweather’s boxing gym, the indy Little Theater and the Lohan School of Shaolin. Established in 2008 as Bosa 1, then the Chefs formed Pho Bosa in 2012. They were formerly at a different Chinatown location. Pho Bosa dishes out classic Vietnamese dishes such as Bun Bo Hue, Bun Rieu, Cha gio, Nen Noung cuon, Com Tam, and of course pho. We highly recommend the Broken Rice with bbq meats. No liquor license. 10:00 am – 9:30 pm Closed Wednesdays. Vegas born chain, now with locations in Flushing, Manhattan, Orlando, Washington DC, West Hollywood and more. Food is served in a plastic bag and you are given a bib and gloves to wear. You’ll also eat with your hands, so dress accordingly. Wine & Beer only. 12:00 pm – 10:00 pm., 7 days a week. 5:00 pm – 11:00 pm. 7 days a week. If you are a fan of AYCE sushi (under $25 per person) and or on a budget, then this place is for you. It’s All you can eat for everything on the menu, not just the sushi items. Beer and wine only. 12:00 pm – 2:30 am, 7 days a week. Golden Tiki – Open 24/7 NO lock on door! FUNNN! New AYCE Korean BBQ and Seafood. Directly next to the Golden Tiki. Formerly Dae Jang Keum Korean BBQ & Tofu Restaurant Details coming soon. Lee’s Sandwiches was founded in 1983 and are the world’s largest banh mi chain with over 60 locations in several states and Taiwan. They are famous for their foot-long bah mi ( Vietnamese sandwich). Open 24/7, 365. Free wi-fi. Small mom and pop restaurant with about 15 seats serving tasty vegetarian & vegan restaurant serving faux-meat dishes, fruit smoothies & boba tea. Small, inexpensive restaurant serving vegetarian and vegan food and very affordable prices. Open from 11:00 am – 9:00 pm. Closed on Tuesdays. No liquor license. Hawaiian Style Poke is a takeout restaurant serving authentic Hawaiian poke made from fish they fly in from Hawaii. Open from 10 am to 6 pm, closed on Tuesday, closes at 5 pm Saturday and Sunday. The Chinatown Plaza was built in 1996 and is what and where Chinatown Vegas started. It quickly started growing first east to west, later north to south. Located in the Chinatown Plaza. Founded in 1945 by Mr. Chang-sung Hur. To date, there are over 3,000 locations worldwide. In addition to the commonly found croissants, mini garlic croissant, and chocolate croissant, there are some less common foods to try such as crab croquet, hash brown bread, fresh cream red bean brioche and a large selection of salads and sandwiches. Open 7 am to 11 pm 7 days a week. No Liquor license. Simple Filipino fast food serving chicken adobo, lechon, pancit and other Filipino staples you choose from a hot buffet. Located in the Chinatown Plaza. Open 9 am to 9 pm 7 days a week. No liquor license. Not as good as the original in California but the combination BBQ pork, soy sauce chicken and roasted duck over steam rice are very good. Open 11 am to 11 pm Monday through Thursday, 11 am 12 pm Friday, Saturday 10 am 12 am and Sunday 10 am to 11 am. Chinatown Plaza. Cash ONLY. No liquor license. Traditional Taiwanese comfort food is served at this Chinatown Plaza diner, from 8 am to midnight, 7 days a week. Authentic food not made for the American palette. Inexpensive but authentic Taiwanese food. Duroc pork chop, oyster omelet, and all pan-fried dishes are recommended. @chinatownfoodie ‘s go-to spot for beef noodle soup. Rich broth, good quality meat, perfectly cooked noodles. It’s very small so there is usually a wait. Open 9 to midnight, 365 days a year. # 1 Boba tea also uses real fruit and NOT powders. Favorites are peanut butter banana slushy, lychee coconut, mango coconut, durian, honey milk tea, and any fresh fruit tea they have. Open from 10:00 am to 9:00 pm 7 days a week and open until 9:30 on weekends. In the Chinatown Plaza. Popular touristy dim-sum restaurant. Open from 9:00 and to 2:00 am 7 days a week. You get two menu’s here; one Chinese and one Vietnamese. Capital seafood serves authentic Chinese food, not made for American tastes. Part of Capital Seafood. Here you’re also given two menus, Chinese and Vietnamese. Open 1o am to 10 pm 7 days a week. Dependable Chinatown Plaza restaurant serves decent, authentic rich and bold flavored Chinese food and its rich bold flavors. Play area for kids. Open 11 am to 10 pm 7 days a week. Located across from the Chinatown Plaza, Magal is a Korean BBQ chain with over 450 locations in Korea. Not AYCE but large portions are more than filling. 11 am to 1 am and until 2 am Friday and Saturday. The original Pho Kinh Do open in the 1960’s in Soc Trang province in South Vietnam. 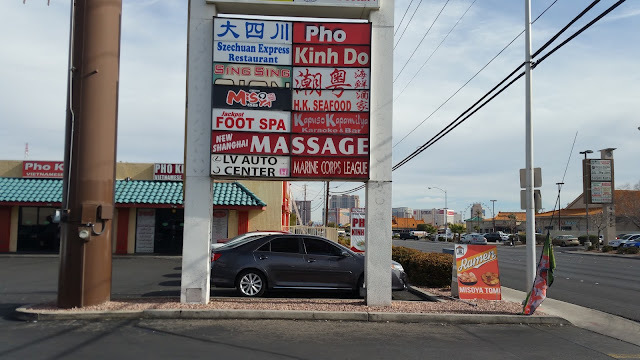 Pho Kinh Do opened in Chinatown Vegas in 2010 and is owned by the son of PKD Vietnam. Very authentic, rich flavored Viet food. Open from 10:00 am – 10:00 pm, 7 days a week. Like sushi and ramen? You can have them both at Go!Ku J-Wraps and Ramen Goku. Open from 10:30 am – 10:30 pm, closed on Wednesdays. Wine and Beer ONLY. Authentic Taiwanese and Chinese breakfast foods as well as crispy chicken rolls, sticky rice, beef noodle soup, and other Taiwanese delicacies. No Liquor license. 7:00 am – 9:00 pm, 7 days a week. You will order northern and southern Chinese food from an iPad at this modern and super clean Chinatown Vegas spot. Try the many varieties of skewers as well as the grilled/BBQ fish. Live seafood on Tuesdays and Fridays. Open from 5:00 pm – 4:00 am 7 days a week. Wine and Beer only. On your left at Spring Mountain / Arville – South corner, is the strip mall at 4355 Spring Mountain Rd. Terrific Chongqing style noodle. Chongqing is in Sichuan province so spicy, bold flavors prevail. The dishes we most recommend are the Chengdu Zajiang noodle, House beef noodle, Chengdu cold noodle, big intestine noodle, as well as the spicy black fungus. Open from 9:00 am – 9:00 pm, 7 days a week. No liquor license. This restaurant has changed owners several times and now the original owner is back. Open from 11:00 am – 2:00 am, 7 days a week. Wine and beer only. Popular Taiwanese boba chain offering a large selection of tea and foods. Franchise chain for Ten Ren Tea Company. Open from 11:00 am to 1:00 am 7 days a week. Pho and banh mi specialists open for breakfast, lunch, and dinner. No liquor license. Open from 9:30 am – 12:00 am and until 2:00 am on weekends. One of the better AYCE sushi restaurants with a large selection of rolls as well as a few Korean dishes. Beer and wine only. Open from 11:30 am – 3:00 am 7 days a week. The original traditional Japanese Izakaya in Chinatown Vegas. Ichiza is still the vibrant late-night hot-spot serving authentic Japanese food. Located on the second floor. If you haven’t been here in a while, go back. They have recently upgraded menu, decor, and service. All You Can Eat( AYCE). Vegas Package at 19.95 and Spring Mt Package at 23.95. Yui would be among the top 3 sushi restaurants anywhere on earth except for Tokyo. Second-generation sushi chef, Gen Mizoguchi was the original Chef at Kabuto. He opened his authentic Edomae restaurant a few blocks east of Kabuto. Small room with two tables in the back of Yui run by the brother. A5 Miyazaki wagyu at below normal pricing. From 6:00 pm to 10:30 pm. Closed on Sundays. wine, beer, and sake only. Reservations strongly suggested. Authentic Hunan style Chinese cuisine. Located next to Yui. Many complain of the service and language barrier as the waitresses speak little or no English. Pricier than the average Chinese restaurant but if you want to experience the spicy wonderful flavors of Hunan cuisine nowhere else does it better. No liquor. From 10:00 am to 10:30 pm 7 days a week. A local chain that’s open 24/7. Very popular with casino and service industry people. Typical bar food and decent beer selection, pool, hi-definition TV sports, video gaming. Chef-owner Brian Howard is a culinary wizard that has assembled a team of culinary wizards and they are dishing out Michelin-level food in our Chinatown. Signature dishes include; Chinatown Clams Casino, beef cheek and marrow dumplings, hearth-baked bread, craft beers and cocktails, and good wine selection. Reservation STRONGLY suggested. Open 5:00 pm – 11:00 pm, closed on Tuesdays. Buffet style all-you-can-eat Korean BBQ. Decent quality and do-it-yourself banchan bar. Wine & beer only. Open from 11:00 am – 12:30 am, 7 days a week. Popular Chinatown Ramen shop. Wine and beer only. Soy and dairy free options available as well as vegetarian dishes. Open from 11:30 am – 11:00 pm 7 days a week. Order delicious hand-made Korean dumplings, pancakes and other Korean specialties at this modern and clean jokbal and bossam spot. Open from 11:00 to 11:00 pm 7 days a week. No liquor license yet. Together with Hobak, 8 oz Korean Steak House are our two best Korean Bbq spots in town. @chinatownfoodie LOVES the Marinated pork collar, short ribs, brisket pork bulogi, and spicy pork belly. Full bar. Open from 11:30 am to 2:00 am 7 days a week. Newest to join the Hotpot craze, Nabe Hotpot is an AYCE (All You Can Eat) Hotpot & Sushi restaurant. It costs $25 per person and that includes seafood. Open from 11:00 am to 12:00 7 days a week. So it’s 2 am and you need a bottle 0f 1982, Chateau Margaux to go with your map tofu? We understand. Joyful House has your back. Plenty a parking (Yes! IN Chinatown Vegas) deep wine selection at this trusty Chinese restaurant. Open from 11:00 am – 3:00 am 7 days a week. Wine and beer only. Like it hot? Then check out this popular LA Korean that offers some dishes you can’t find anywhere else in Vegas. Some diners complain about the price and portion size but some quality food is served here. Open 7 days a week and closed only between 3:00 and 4:30 am. Conveyor belt sushi that’s open from 11:30 to midnight 7 days a week and until 2:00 am on weekends. The conveyor belt is always running, not just during peak hours which for fans of conveyor belt sushi is a plus. Full bar. Before Hobak upgraded our Korean BBQ scene, Honey Pig was the place to go. This Chinatown Vegas Bbq still serves delicious food 22 hours a day. Beer and wine only. Closed from 8:00 am to 10:00 am 7 days a week. For us, this was the first truly authentic Pho restaurant in town. Back in the hands of the Vu family (District 1, Viet Noodle bar, etc.,etc., If you are looking for delicious Pho and other Vietnamese foods, dine here from 9:00 am – 1:00 am 7 days a week. Beer and wine only. Fun and lively authentic British pub that’s open 24/7/365. They bill themselves as Las Vegas’ home for soccer” so futball fans take note. Full bar with a decent selection of bottled and draft beers and a few ciders to help wash down your scotch eggs or fish and chips. Popular fast-casual Japanese restaurant that specializes in Udon noodle dishes.No liquor license. Open from 11:30 am – 3:00 pm 5:30 pm – 9:30 pm 7 days a week and until 10:00 pm on weekends. No liquor license. Fun Japanese Yakiniku (BBQ) restaurant chain with 700+ worldwide locations. They also offer AYCE. Full bar. Open from noon to 12:30 am 7 days a week. Hole-in-the-wall takeout specialists that cook Chinese-American food. Popular for parties. Go here for the pork, bacon and rabbit soup with twisted tofu! Decent Xiao Long Bao, but not as good as Niu Gu’s. Open from 11:00 am to 10: pm. Closed on Thursdays. Beer and wine only. The former Jianga, this is a lunch and dinner AYCE sushi restaurant. Wine, beer and sake only. Open from 11:30 to midnight 7 days a week. New Korean that took over the former Omae space. Delicious Bossam (Napa Wrap w/ Pork), Nangmyun, Braised Beef Ribs with Spicy Garlic and all of the noodle dishes. Open from 11:00 am – 11:00 pm. Wine and beer only. Great chamango! Other recommended items are the horchata, strawberry tamale, and mangonada. Open from 10:00 am to 9:00 pm 7 days a week. From Spring Mountain a few steps north at Decatur and Desert Inn Rd is the fast, casual cheap Mexican. No liquor, open from 7:30 am – 11:30 pm 7 days a week. Many critics consider Raku to be one of the top 5 Japanese restaurants in America. We agree. A favorite of Andrew Zimmern and the Late Anthony Bourdain as well as dozens of celebrity and Michelin star chefs so obviously a secret no more. Reservations STRONGLY suggested. Open from 6:00 pm to 3:00 am. Wine Beer and Sake. Very popular and inexpensive ramen restaurant in the super busy foodie favorite Seoul Plaza. The tonkatsu broth is extra rich and yummy, the result of boiling the pigs head for hours. Wine and beer only. Open from 11:30 am – 11:00 pm 7 days a week and until 1:00 am on weekends. Besides perfectly cooked chicken katsu and the pork tonkatsu, Other Japanese Curry Zen favorites are Croquette Curry, Japanese Meatloaf Curry. Popular add-ons such as Kurobata Sausage, Fukujin red pickles or Spam. Raku’s younger sweeter sister serves Japanese style desserts with flair. There are a few booths, but you will want to sit at the counter to watch the magic. High-quality ingredients whipped up into heavenly bites. Seating is limited. Open from 6:00 pm to midnight and from noon to midnight on weekends. Closed on Wednesdays and close at p:00 pm on Sundays. Wone beer and sake. The game changer for sushi in Las Vegas. This intimate, traditional edomae sushi that would be in the top 5 sushi restaurants in any city in the world except for Japan. Tiny sign so hard to spot from the road. Next to Sweet Raku in the super busy Seoul Plaza, a foodie mecca-mall. Open from 6:00 pm – 10:30 pm. Closed Sundays. Reservations are taken up to two months in advance and are STRONGLY recommended. Basically impossible to park so use Lyft or Uber. Use promo code “Chinatown Vegas” and get free rides and credits! Italian food as found in Japan. Not Japanese/Italian fusion. Las Vegas food critic John Curtas said “on his worst night, Kengo Nakamura is bound to be whipping up more interesting than almost any Italian restaurant off the Strip, adding “, the cooking and presentation here is light years beyond your average pasta palace…or even an over-priced, pseudo-sophisticated one” Open from 11:45 am to 11:30 pm 7 days a week. Wine, beer and sake only. If you’re craving inexpensive, clean, NY style Chinese done right, go here. Open from 10:00 am to 11 pm 7 nights a week. No liquor license. Although this Sichuan-ish style restaurant has a full-size menu, fans head over to the buffet for the self-service hot pots. Open from 11:00 am – 11:00 pm. No liquor license. Another spot when it’s 2:00 am and you’re craving karaoke and okra or bacon wrapped enoki mushrooms, pork belly skewers or seafood mini hot pot as well as other Asian dishes. Open from 5:00 pm – 3:30 am and until 5:00 am Friday-Sunday. Beer and wine only. This is the 2nd sushi restaurant in las vegas, the first one is Sakana. Hidden on the first floor in the far right corner. Clean and consistent. They also have an AYCE option. From 11:30 am – 12:00 am 7 days a week. Wine beer and sake. Located above Yoba. This was formerly Bazik. 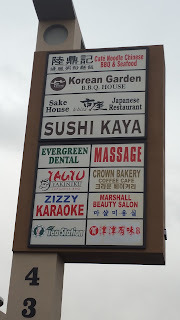 Another great option for a food and karaoke experience. Creole, Cajun, and Korean dishes. Full bar, nice single malt selection Open from 6:00 pm to midnight 7 days a week and until 2:00 am on weekends. Family-owned authentic Malaysian cuisine. The chef is from Penang. Favorites include Roti Canai, Satay Chicken / Beef, Curry Puff, Kang Kung Belacan, Char Kuah Teow and Nasi Lemak. Beer and wine only. Open from 11:00 am to 10:00 pm 7 days a week. Tucked away and hidden upstairs, Baan Thai offers Thai, vegan and Chinese dishes in a simple, spacious setting. Go for the fried tofu laab and spring rolls and veggie tom kha with steamed tofu. Wine and beer only. Open from 11:00 am – 11:00 pm 7 days a week. Banh Mi (Vietnamese sandwiches), soup & more served at a counter or with table service. We liked the Northern Vietnamese dish – Banh Cuon ( Rice noodle rolls) and Com bo luc lac ( Shaken beef). Open from 9:00 am to 10:00 pm 7 days a week. No liquor license. Love woman in their underwear and in lingerie? Than this boba shop is for you. The address is confusing, but it’s upstairs top right next to Hue Thai. There is also parking at the top. From 6:00 pm to 1:00 am 7 days a week. No liquor license. Large, clean, Cantonese and BBQ specialists serving lunch and dinner 7 days a week. Favorites are the BBQ duck, goat in a clay pot and live seafood. Beer and wine only. From 11:00 am – 1:00 am, 7 days a week. Dongbei influenced restaurant that serves noodles, boiled dumpling, fried dumpling, a variety of veggies and meats and other traditional Northen Chinese dishes. Open from 8:00 am to 10:00 pm 7 days a week. No liquor license. Owned and operated by the Vu family ( Pho So 1, District 1) @Chinatownfoodies FAVORITE pho. Spacious bustling room with a 21 hours a day kitchen dishing out amazing pho and other Vietnamese specialties. Open from 9:00 am to 6:00 am 7 days a week. Full bar. Original crafted edomae sushi, sashimi, and rolls by Chef Takashi. Sushi Takashi offers a huge selection of Japanese tapas and a nice selection of sake, Japanese Whiskey, Chu-Hai, and Cocktails. An Argentian restaurant that also doubles as a market. Load up your freezers with delicious empanada’s or dine in for many Argentinian specialties. Wine and beer only. From 9:00 am to 8:00 pm Monday – Thursday, until 10:00 on Friday and Saturday and from 10:30 am to 8:00 pm on Sundays. A partnership between Khai Vu ( District 1, Le Pho) and Luis De Santos, a Master Sommelier. You will find Spanish & Latin-inspired cuisine with a touch of Japanese flair. Tiny restaurant, sit at the bar for best time. Wines are all picked by Mr. De Santos, the world’s first Filipino Master Sommelier, so expect some bargains and gems.. Open from 5:00 pm to 1:00 am 7 days a week. High tea and postcards. La Postte is a family owned business that specializes in freshly brewed tea leaves, flavored milk tea and fruit tea, cakes and crepes, and a unique postcard mailing service. Open 7 days a week from 1:00 pm to 12:30 am and until 9:00 pm on Wednesdays. Small mom and pop Korean that is NOT a BBQ restaurant. Homestyle dishes such as spicy cold noodles, kimchi dumplings, hotpot bibimbap, spicy tofu seafood soup, or braised monkfish. Open from 11:00 am to 11:00 pm. Closed on Sundays. Cantonese seafood restaurant that also serves traditional delicacies such as braised squab, duck and pork. No liquor license. Open from 11:00 am to 11:00 pm 7 days a week. Small family owned banh mi shop that is a better alternative to Lee’s Sandwich. They also have some other Vietnamese home-style cooked meals. Open from 8:00 am to 8:00 pm. Closed on Tuesdays. No Liquor. Cantonese BBQ specialists serving crispy pork belly, duck, and every part of a pig, CASH ONLY. From 10:00 am to 10:00 pm 7 days a week. No liquor license. Semi-authentic Sichuan restaurant that serves well prepared and flavorful food although some dishes have been Americanized. We love the pork blood hot pot and the pork liver as well as the boiled fish in hot sauce. Open from 10:30 to 9:30 7 days a week. 24-hour local bar hangout with decent bar food, darts, and gaming. The next strip mall on your right-hand side has 4 restaurants. Parking is very difficult. We suggest using Lyft and use Promo Code ” Chinatown Vegas” to get free ride credits. Hobak means pumpkin in Korean and this is the first Hobak to open in the USA. There are 16 “Hobak family” restaurants in Korea. Very airy, the hip room serves heritage pork, Angus beef, and higher quality products than your typical Korean BBQ spot. Expect long lines. Wine and beer only. Open from 11:30 to 11:00 7 days a week and until 12:00 on Friday and Saturday. So unassuming, it’s a different world when you open the door to this trendy and hip coffee shop. Gabi specializes in craft coffee and artisan pastries as well as offering some tasty salads, sandwiches and brioche toasts. Open from 9:00 am to 11:00 pm 7 days a week. Worldwide bubble and fruit tea chain with over 800+ locations. Huge menu with over 50 offerings. Loud music and festive atmosphere. Open from 11:00 am to 11:00 pm 7 days a week. Tokyo style ramen house with no tables, but you’ll sit at a bar that overlooks the open kitchen. Do not miss the Chashu! Wine and beer only. open from 11:30 to 10:00 pm 7 days a week and from Noon to 10:00 pm on Saturday and Sunday. Authentic homestyle Cantonese restaurant that specializes in low prices and good food. Try the steamed or pan-fried flounder for under 8 bucks! Dim sum served during lunch hours. Wine and beer only. Open from 11:00 am – 12:00 am 7 days a week. Authentic home-style cooking by a chef from Hunan. Twice cooked pork, pork belly, steamed fishes are recommended. Wine and beer only. Open from 11:00 am to 10:00 pm. Closed on Mondays. Craving feta cheese or sun-dried olives? We got you. Mediterranean & Middle Eastern specialty foods plus fresh halal meat, cheese & prepared foods. Open Monday through Saturday from 9:00 am – 8:00 pm and 11:00 am – 5:00 pm on Sunday. Konbea Belt Sushi is Las Vegas’ first and only A.Y.C.E. conveyor belt sushi and was created by the same owners of Kaizen Fusion Roll & Sushi on Paradise Rd. All you can eat is $25.99 per person. Wine and beer only. Open from 11:30 to midnight 7 days a week. Longtime contender for best Chinese has seen its better days. Several ownership changes and quality has been up and down. Currently closed as the menu is being upgraded as well as the restaurant being remodeled. Niu Gu means “Beef Bone” in Chinese. Do not miss Chef Jimmy Li’s 8 hour-slow braised short rib, triple chili shrimp, dry pots and the city’s best handmade Xiao Long Bao. No liquor but you can bring your own wine or beer. Excellent tea program with some tea you can’t find anywhere else and a beautiful one-of-a-kind tea table, made from one tree. Open from 11:00 am to 10:00 pm 7 days a week. After 5 PM, sk for the “8 Dishes” menu. Order each and share. Trust us. The worlds first refrigerated conveyor belt hotpot restaurant but here your hotpot is elevated. Chubby Cattle raise their own breed of Dorper sheep organically for all the Chubby Cattle restaurants. They use certified A5 Miyazaki from Japan as well as making noodles by hand, such as green tea noodle, wild yam noodle, and traditional wheat noodle. Expect to wait even with reservations. Chubby Cattle is the countries best Hotpot restaurant in our opinion. Full bar. Open from 5:00 pm – 11:45 pm 7 days a week. Upbeat Karaoke bar that serves Asian fusion snacks such as sweet potato pizza, bulgogi pizza, potato bacon pizza, Korean style deep fried chicken, popcorn chicken, and chicken wings. They serve only wine and beer and are open 7 days a week from 5:00 pm to 3:00 am. Located in the former Chada Thai space, this new, small, intimate Spanish tapas restaurant is lighting up Chinatown. They offer a full bar and solid wine, beer, and cocktail program. The octopus and flan are not to be missed. Las Vegas Food Critic John Curtas wrote this on his website ” if you’re looking for the most interesting Spanish food ever to come to off-Strip Las Vegas, you’ve come to the right place.” Open from 5:00 pm – 1:00 am and until 2:00 am on Friday and Saturday. Chef Khai Vu’s first restaurant on his own. The creators of “Lobster Pho”, this Vietnamese hot spot serves some traditional Vietnamese dishes as well as some inventive dishes that are now classics such as Viet beef carpaccio, surf & turf pho or oxtail fries. Huge whiskey selection, good beer selection and wines by the glass, a variety of Pappy Van Winkle’s, and Fernet on tap. Open from 11:00 to 2:00 am. Closed on Tuesdays. Parking is nearly impossible here. Download Lyft Use Promo Code “ChiantownVegas” and get free ride credits! The small, intimate ramen house opened in 2012 and often gets overlooked in this extremely busy mall. They serve authentic ramen dishes at a low price. Wine and beer only. Open from 11:30 am to 11:00 pm 7 days a week. Cash ONLY and closed on Fridays this is a small, busy restaurant that features whole roasted duck, pork and offal. Open from 10:00 am to 9:00 pm. They have the standard Chinese dishes but go here for Bbq. No liquor license. Hachi is a Japanese Izakaya house featuring yakitori hand grilled with the highest quality Binchotan Charcoal. They also feature an assortment of Japanese dishes along with sashimi. Open from 5:30 pm to 2:00 am 7 days a week. Wine and beer only. Started as a food truck and featured on the TF Food Network, this free-standing building is a counter-serve spot that offers burgers with Japanese flavors. On a really tight budget but you still want some authentic Chinese food? Then head into the 168 Market to its small food court. At its hot buffet station, you will see noodles, rice, several pork and chicken dishes, tofu, fresh fish and more. Choose three items for 6 bucks! Come with soup too. Open from 8:00 am to 10:00 pm 7 days a week. Traditional Hong Kong and Chao Zhou style Chinese cafe that merges traditional noodle soup with Chau Zhou favorites. Open from 11:00 am to 10:00 pm. Closed on Mondays. Wine and beer only. Heading north on Jones at the corner of Jones and Desert Inn is Fiesta Filipina, a small chain that started in Daly City, California and expanded into Las Vegas. Authentic Filipino style grilled BBQ (pork & chicken), Crispy Pata, Pancit Palabok, Fried Boneless Bangus (Fried Boneless Milkfish), Turon (banana fritters), Beef Caldereta, Dinuguan, Lechon Kawali. No liquor license. Open from 10:00 am to 8:30 pm 7 days a week. Originally opened in LA in 1987. Pho 87 serves a solid, authentic Pho. The owner is very political so if that annoys you stay away. But the food is solid. No liquor license. Opened from 10:00 am to 9:00 pm. Closed on Wednesdays. A few steps south of Spring Mountain is Aracely’s, an authentic Columbian restaurant that features beef empanada, bunuelo’s, pan de bonos, arepa, chicharron, fried plantain, chorizo and more. Open from 10:00 am to 9:00 7 days a week. Closes at 8:00 on Sundays. Wine and beer only. Fast take out with tacos, empanada’s, burrito’s, torta’s tostadas and other Mexican foods at very inexpensive pricing. Open from 10L00 am to 8:00 pm 7 days a week. Although Chinatown Vegas has not been geographically identified yet, generally speaking, it ends at Jones/Spring Mountain. Continuing west on Spring Mountain you will go a few blocks through a residential area then when you reach Rainbow you will find the Korea Town Mall. There is a Greenland Market with a food Court as well as a few adjacent restaurants in the shopping center. Chef Kenny is Founder of Veggie House restaurant in Chinatown. He is no longer affiliated with Veggie House. No animal products are in this restaurant. All are made with veggie-based ingredients. Open from 11:00 am to 9:30 pm 7 days a week. Authentic Korean food from a food court. tofu soup (soondubu chigae), seafood soup, short ribs, bulgogi, spicy octopus, and Korean pancakes. Open from 11:00 am to 9:00 pm 7 days a week. Budget priced sushi, ramen, and poke are served in this food court restaurant. Better, cheaper and bigger portions than premade supermarket sushi. Open from 11:00 am to 9:00 pm 7 days a week. Soondae, the traditional blood sausage dish, yu gae jang (spicy soup), spicy and sweet the noodles and other Korean specialties can be found at low, food court prices. Open from 10:00 am to 9:00 pm 7 days a week. Don’t let the food court theme prejudge this family-owned KFC ( Korean Fried Chicken ) restaurant. We haven’t had all the dishes here but the fried chicken is legit. Not Wings but the entire chicken fried and then cut up. Crunchy, juicy and delicious. Open from 10: am to 8L30 pm and closed on Sundays. Aloha. Paina Cafe serves poke bowls, beef bowls as well as spam musubi, ube flat roll, cream puff, tart or pies. Chinatown Vegas is continuously evolving. We will keep this a live page with frequent updates. We have not included fast food chains such as Subway in which there are several, McDonalds, Carl Jr’s, Jack n the Box, Church’s Chicken etc., etc. The total of our restaurants has surpassed 150+ and cover all the culinary bases. Culinarily, the bar is set high in Chinatown Vegas. There are not bad restaurants. Only the strong survive. A restaurant we rated “GOOD” would most likely be one of the top-rated restaurants in other Chinatowns. A restaurant that has no rating does not mean it isn’t good. It can be a number of factors, such as the length of time of our last visit etc., In addition, Tea and Boba shops not rated. A restaurant rated “GOOD” usually has a dish or two or three that it’s best known for and is consistent. A restaurant rated “VERY GOOD” usually has several recommended dishes in addition to better than average Chinatown service, atmosphere or other factors. A restaurant rated “RECOMMENDED” is a restaurant you will want reservations at and is a must try while in Vegas. A restaurant rated “WORLD CLASS” is a restaurant that fires on many cylinders and would be a top 10 in any City anywhere. Download Lyft Use Promo Code “ChinatownVegas” and get free rides and credits!